Chairwoman of Knesset Interior Committee slams Shin Bet for refusing to divulge criteria for freeing terrorists. 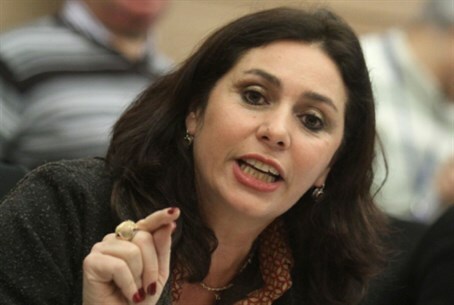 The Chairwoman of the Knesset's Internal Affairs Committee, MK Miri Regev (Likud), said Monday that Israel "releases terrorists and receives missile fire, murder and terror." She joined a relatively long list of Likud MKs who came out strongly against the decision to free terrorists as a "gesture" to the Palestinian Authority in exchange for "peace talks." Regev criticized the Shin Bet for refusing to send a representative to her committee's special session on the upcoming terrorist release, a refusal which the Shin Bet said was due to the fact that the debate was open to the public. "You cannot hide behind a mantle of secrecy and refrain from presenting the criteria according to which 26 terrorists, terrible murderers whom we intend to free, were selected," she said. Noting once again the rocket fire from Gaza that took place Monday morning, Regev added: "The Palestinians in Gaza dig terror tunnels into Israeli territory and recently, three Israelis were murdered. This equation, of terrorists for negotiations, must stop." MK Shuli Moallem (Bayit Yehudi) said at the session that the decision to free terrorists is a case of "serious political blindness." Surprisingly, she was joined in this position by MK David Tzur of Hatnua, the party headed by Minister Tzipi Livni, who also geads the Israeli negotiations team discussing a "peace deal" with the Palestinian Authority.